Prototype: German Railroad, Inc. (DB AG) class 217 general-purpose locomotive. 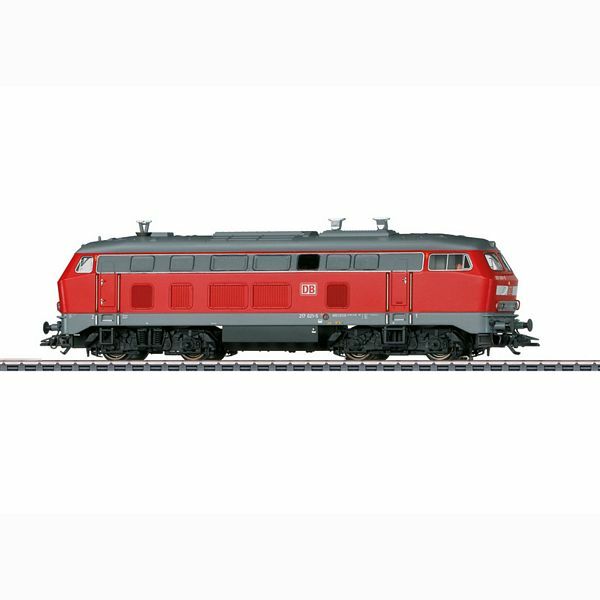 Diesel hydraulic locomotive with electric train heating. "Traffic Red" paint scheme. Exhaust hoods included. The locomotive looks as it did in 2003. Road number 217 020-7. Model: The locomotive has an mfx+ digital decoder and extensive sound functions. It also has controlled high-efficiency propulsion. All four axles powered. Traction tires. The triple headlights and dual red marker lights change over with the direction of travel, will work in conventional operation, and can be controlled digitally. The cab lighting can be controlled digitally. Maintenance-free warm white and red LEDs are used for the lighting. The locomotive has a locomotive engineer figure in cab 1. The locomotive has separately applied exhaust hoods. It also has separately applied metal grab irons on the sides and ends. The locomotive has detailed buffer beams. Brake hoses that can be mounted on the locomotive are included. Length over the buffers approximately 18.9 cm / 7-7/16". This model is being issued in a one-time series.